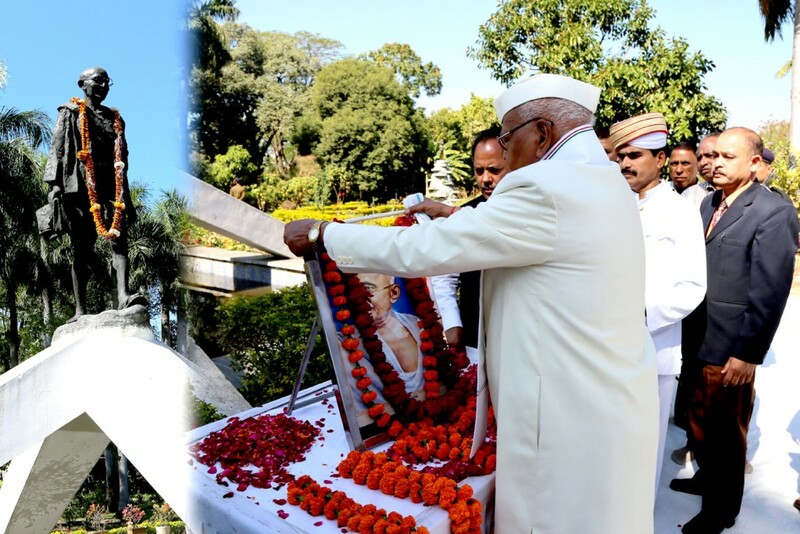 Bhopal, January 31, 2016 (Ataullah Faizan): Governor Mr. Ram Naresh Yadav paid floral tributes to Father of Nation Mahatma Gandhi by observing 2-minute silence. The Governor said that youths of the country need to imbibe and follow of Mahatma Gandhi’s ideals, ideology and principles. The Governor said that Mahatma Gandhi’s feat of ensuring India’s independence without violence and use of weapons will be kept written in history in golden words. Mahatma Gandhi was a practitioner of truth, non-violence and peace. Mr. Yadav said that true tribute to Mahatma Gandhi would be when we take pledge today to be firmly committed to imbibe his ideals in our lives. Earlier, the Governor paid floral tributes to statue of Mahatma Gandhi on the premises of old Vidhan Sabha. Principal Secretary to Governor Mr. Ajay Tirkey, senior officers and employees of Raj Bhavan were present on the occasion.